Khafre Kujichagulia Abif, MLS is an Atlanta-based AIDS & bisexual activist, writer, editor, blogger and artist who has been thriving with HIV for 28 years. Khafre has been honored the be selected as HIV Plus magazine one of 75 Most Amazing People Living with HIV in 2016 and by POZ magazine as one of The 2015 POZ 100: Celebrating Long-Term Survivors. Khafre was among the Bisexuals at The White House in October 2015. Khafre has been appointed as a member of the Georgia State Advisory Committee (SAC), to the United States Office of Civil Rights, representing the State of Georgia. His appointment, announced on June 1, 2016, was approved by the Commissioners of the United States Office of Civil Rights in Washington, D.C.
Khafre is the Founder and Executive Director of Cycle for Freedom. This innovative project is a national mobilizing campaign founded in 2010 to reduce the spread of HIV among African Americans and Latino’s by confronting the three critical issues that fuel the HIV pandemic: attacking HIV-related stigma, homophobia, and lack of education. As an author with several publications to his credit, Khafre is the editor of the anthology, “Cornbread, Fish and Collard Greens: Prayers, Poems & Affirmations for People Living with HIV/AIDS”, a 2013 publication from AuthorHouse. Brian comes with a long list of experience and education and has been a very big influence in bringing forth our bisexual health concerns. Dr. Dodge's training has focused on a variety of social and behavioral aspects of sexual health in relation to HIV/AIDS, other sexually transmitted infections (STI), and other facets of overall well-being. His research focuses on health among understudied and underserved sexual and gender minority individuals and communities. A nationally recognized expert on bisexual health, Dr. Dodge is a co-director of the Bisexual Research Collaborative on Health (BiRCH), a partnership of Indiana University School of Public Health-Bloomington, University of Illinois at Chicago, and The Fenway Institute. The collaborative encourages research and inspires increased awareness in improving health among bisexual individuals through the combination of academic study, an intersectional lens, and community-based advocacy. Dr. Dodge is an Associate Professor in the Department of Applied Health Science and Associate Director of the Center for Sexual Health Promotion at Indiana University School of Public Health-Bloomington. He is also appointed as a research faculty member at The Fenway Institute in Boston, Massachusetts. He is an associate editor at Archives of Sexual Behavior, has served as Chair of the HIV/AIDS Section of the American Public Health Association (APHA), And remains involved in a wide range of scientific and community-based sexual health initiatives. BiNet USA is proud and thankful our new board members will bring a variety of talents and expertise to our organization. Welcome!! On Friday and Saturday, February 3-4, 2017 the National Black Justice Coalition (NBJC) — in collaboration with the National Black Gay Men’s Advocacy Coalition, SisterLove, National Black Women’s HIV/AIDS Network and The Global Network of Black People Working in HIV — convened Black HIV and AIDS policy experts for a two-day meeting with the goal of shaping Black America’s HIV and AIDS health policy agenda for the Donald J. Trump Administration. This historic convening was held in Washington, DC. Khafre Kujichagulia Abif attended on behalf of the Black bisexual+ community. Special thanks to Dr. Herukhuti for his assistance bringing this event to fruition. Thank You Khafre for representing our community! BiNet USA warmly welcomes Khafre to our board! WELCOME TO THE NEW BiNet USA GROUPS! 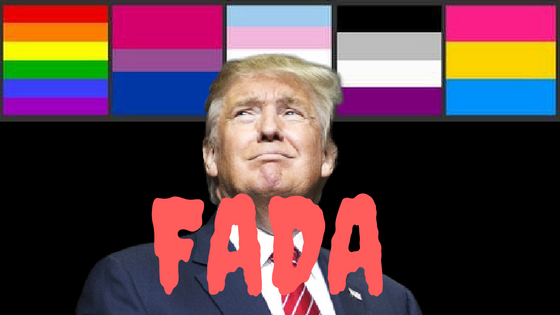 Great news for bi+ activists! BiNet USA is excited to announce a new Google Groups Mailing List Service that can help you build your network and keep abreast of developments in the bisexual+ community. These self-supported, decentralized Google groups, made possible in part by a G Suites grant from Google Non Profits to BiNet USA, will be an invaluable resource for bisexual+ community members, LGBTQIA bi+ allies, and straight bi+ allies. Admission into these groups are by application to ensure that users follow the BiNet USA communications guidelines, located here, and that group members goals for membership align with the spirit of each group. Links for the applications are below. New BiNet USA Mailing Lists! The Net - The Net is a group of bisexual supportive lesbian, gay, bisexual, pansexual, fluid, queer, intersex, transgender, genderqueer, asexual, straight, cis and nonbinary technologists working to support online safety for progressive communities. BRRRN - Biphobia Rapid Response Right Now (BRRRN) is intended for media, communications and social media professionals and activists interested in being part of bisexual community rapid response actions to biphobia. BiALERT - The BiAlert group provides alerts for time-sensitive progressive, LGBTQIA, and bi+ advocacy opportunities from across the country. Bi+PolicyWatch - Bi+PolicyWatch is for bi+ advocates and activists interested in updates, latest reports, and general opportunities related to state, federal and local level policies affecting the B in LGBT. BiMH - Bisexual+ Mental Health Professionals and Students networking list is intended for bisexual mental health professionals. BiNetChat - The BiNetChat list is a general, bisexual chat group for advocates across the country to stay in touch, share baby photos or their latest writing and research, give us coupling/decoupling news, provide notifications of births and passings, and generally keep in touch. BITA - BITA is for bi+, trans, intersex and asexual advocates to stay connected with each other across movements. LGBT+POC - This group is meant for national LGBTQIA people of color leadership. Want to make your own group? This is the beauty of this decentralized model. 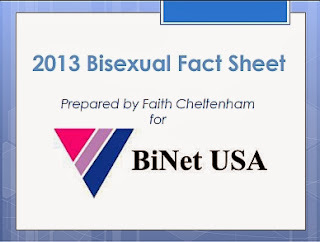 As long as you adhere to BiNet USA Social Communications Guidelines found here and keep your mailing list or group bisexuality supportive, we welcome you. Click here to get started. What can’t this lady do? Alexandra Bolles, this year's Brenda Howard PFLAG award winner, recently became Sr. Strategist for Campaigns at GLAAD, a world leader in lesbian, gay, bisexual and transgender (LGBT) media advocacy. Bolles was nominated for the Brenda Howard award by former BiNet USA President Faith Cheltenham in part due to her work co-founding Bisexual Awareness Week, a week long celebration of #bipride and #bivisibility that usually falls around Celebrate Bisexuality Day itself on September 23rd. 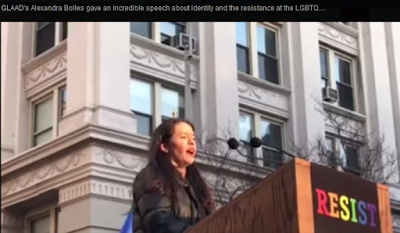 Alexandra tells the BiNet USA blog that she looks forward to doing even more for bi advocacy in her new role and spoke a bit about that while receiving her award from PFLAG Queens. One of her first projects in her new role is the LGBT Creative Community against Anti-LGBT legislation in Texas campaign, #TXtogether. GLAAD joined Equality Texas, The Ally Coalition, and leading artists, entertainers, and influencers, to release an open letter with more than 140 signatures opposing bills that threaten to harm the LGBTQ community in Texas, particularly transgender people in the Lone Star State. As Alexandra says - "I am visible so kids do not have to work as hard to love themselves"
BiNet USA looks forward to partnering with Alexandra and GLAAD again this year to bring #biweek to all of our wonderful community! Boston, MA – The Bisexual Resource Center (BRC) will celebrate Bisexual Health Awareness Month (BHAM) for the fourth consecutive year with the launch of a social media campaign beginning March 1st, 2017. 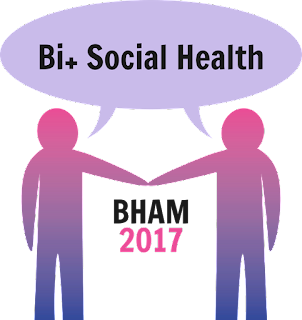 BHAM aims to raise awareness of health disparities within the bisexual+ community and promote resources and action; this year, the campaign focuses on social health disparities and steps to build social support and resiliency. 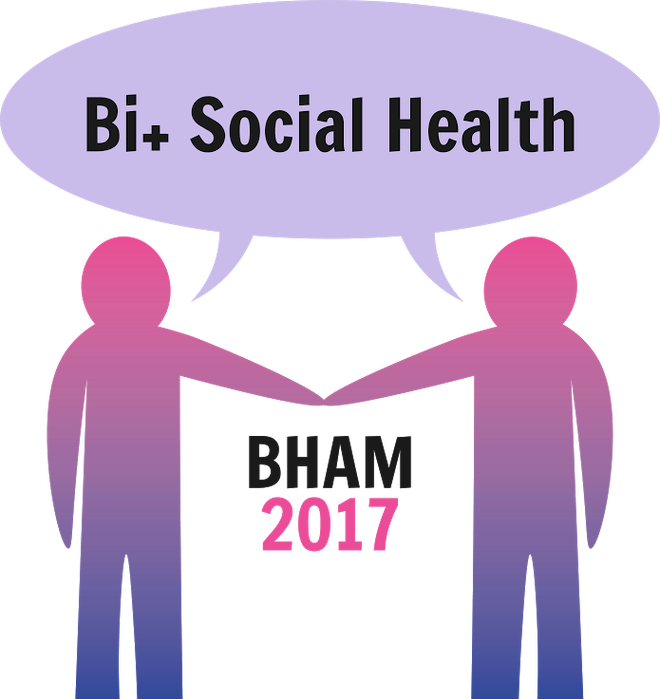 The campaign will run on the BRC’s Twitter @BRC_Central (using #BiHealthMonth and #BHAM17), Facebook, Tumblr, blog, and campaign website. The BRC invites individuals and organizations to participate in the campaign online and within their own communities. March 27-30: (Community) Showcasing bi+ experiences of community relationships, resources to improve bi+ competency in schools, workplaces, healthcare settings, etc. For more information, please visit the BHAM campaign website: www.bihealthmonth.org. The Bisexual Resource Center (BRC) has been advocating for bisexual visibility and raising awareness about the needs of bisexual people throughout the LGBTQIA and straight communities since 1985. The BRC envisions a world where love is celebrated, regardless of sexual orientation or gender expression. Visit www.biresource.org for more information. This year's #BiHealthMonth is focused on Social Health. @BRC_Central will provide stats, resources, & opportunities for action during March! I'm celebrating #BiHealthMonth by following @BRC_Central's campaign on Social Health! We're celebrating #BiHealthMonth by following @BRC_Central's campaign on Social Health! Tara is a Former Chair Los Angeles Bi Task Force, publisher of ALPHABET and Primahood: Magenta which feature bi creators and bi content, cartoonist of bi-themed webcomic Gooch. They also are a Board member of Prism Comics since 2012 where they work to improve bi inclusion in LGBTQAIU comics activism. They participated in bi-specific panels at San Diego Comic-Con and Queer Comics Expo. They obtained 501(c)3 status for the Los Angeles Bi Task Force and organized three Bi Arts Fests. They organized and were a part of the first bi-specific art exhibit to be show at the Los Angeles LGBT Center's Village Gallery. "I'm a Bisexual Man: Why Is That So Hard For Me To Say" in Buzzfeed. https://www.buzzfeed.com/sethf7/im-a-bisexual-man-why-is-that-so-hard-for-me-to-say?utm_term=.ymzlZ1ZYp#. ~ Co-editor, Bi Men: Coming Out. ~ Editor, Bi Guys. ~ Editor, Bisexual Perspectives on the Life and Work of Alfred C. Kinsey. ~ Author, Extraordinary Adventures of Mullah Nasruddin. ~ Four-time Lambda Literary Award Finalist in Bisexual Literature. ~ Huffington Post: "Where’s the ‘B’ in National LGBTQ Organizations? The Bisexual Representation Report Card" ~ "Bi Media Lags Behind Ls, Gs and T And a former board member, Bisexual Resource Center of Boston. Cliff was the former Patient Services Assistant at Dept. of Veterans Affairs, Boston. MA. Bisexual Community Activist ; and Gay, Lesbian, Bisexual, Transgender and Heterosexual Military Veterans Advocate. On May 3rd 1989, Cliff Arnesen became the first openly bisexual Veteran to testify before members of the United States Congress during formal hearings held before the U.S. House Committee on Veterans Affairs: Subcommittee on Oversight and Investigations -- addressing healthcare issues relating to LGBT veterans who suffered fr0m AIDS, homelessness, Agent Orange, drug and alcohol abuse, and less-than-honorable gay and bisexual related discharges. He continues to advocate for the rights of LGBT veterans as president of New England Gay, Lesbian, Bisexual & Transgender Veterans, Inc. Subsequently, he testified on the “Don’t Ask, Don’t Tell” policy. He became the National Vice President of Legislative Affairs for the Gay, Lesbian and Bisexual Veterans of America and the President of the New England chapter. He continues to advocate tirelessly on their behalf. ABilly is retired as a public health researcher and has been involved in LGBTQ activism since the early 70s. And in civil rights activism since the 50s. He also contributed to First Comes Love by Barbara Proud, the coffee table book that profiles 60 couples who have been in relationships for a long time. He and Cris (ABilly’s partner) were the only couple identifying as Bi. He will be 75 come March 21st; am semi-handicap due to mobility challenges. He identifies as Caribbean African American and as a queer bisexual in a same gender relationship for 38 years (he also identifies a bisexual). ABilly will be the oldest member of the board to join! BiNet USA is proud and thankful our new board members bring a variety of talents and expertise to our organization. Welcome! !